What will your robot do? Who will it be? Is it compact and powerful or tall and fragile? 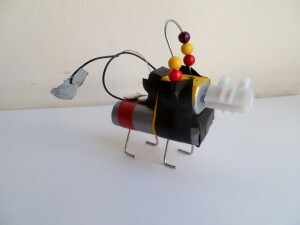 This workshop teaches participants to make their own vibrobot from ordinary everyday materials. A vibrobot is a simple robot based on a battery pack and an un-balanced motor. The technical structure of the battery and motor is pre-designed and easy to execute. Each student makes their own vibro-motor and then moves on to the hard part: Designing the robot itself. The body of a robot decides how it moves and what it does: Long legs will make it wobbly, a foot made out of foam will make it slow. Using the rotation of the motor makes it easy to add extra power by un-balancing the motor further or building a propeller. The robots are made out of a vast array of everyday materials, styro-foam, wire, toothpicks, clothespegs and fabric. An important part of the workshop is to show how the bot can be repaired, changed and recycled later. As you choose the materials and build the body, you design exactly the robot companion that you would like. A fighter, a cleaner, a dancer. Through this process each of us change from consumers to makers, we get a chance to express our desires and wishes, and if you can build this, you can build anything. And if you can build things, then you can play an active role in a world of things. And then everything can be changed, modified, hacked, tailored to you and by you. Welcome to the world of makers. Result: Your own personal robot to take home.